Contact us 24 hours a day from anywhere around the world for amazing deals on private jet charters in Port St. Lucie, FL, USA. We arrange private charter flights to/from Port St. Lucie with services available around the clock. Our aviation services extend across the United States and around the world, with free quotes with no commitment to book, competitive hourly rates on aircraft rentals, and all-inclusive contracts with no hidden fees. We also hold ourselves to some of the highest safety standards in private aviation. Call +1-888-987-JETS (5387) for pricing and availability on Port St. Lucie private jet charter flights. Palm Beach Jet Charter utilizes the following airports to fly clients privately to/from Port Saint Lucie, Florida and neighboring areas. Charter a private flight to this quaint little beach town and spend your days relaxing with your toes in the sand, the sun on your skin, and quiet all around. There really isn’t much going on in Port St. Lucie, and that’s what makes it so attractive. There’s a few gourmet restaurants, some oyster bars, seaside cottages, and friendly locals. If you want more excitement, an excursion to West Palm Beach will only take about 45 minutes. Whether you’re visiting the Treasure Coast for a bit of rest and recovery, or you’re hoping to find a nice little seaside cottage for your next getaway, the best way to get there is via luxury private jet. And the best company to help you do just that, is Palm Beach Jet Charter. Wyvern certified, our jet charter representatives have the experience to accommodate all of your needs- hassle free and efficiently. Upon request, we can arrange everything from multi-leg private flights and gourmet in-flight catering to luxury ground transportation and private helicopter lifts. And to ensure that your needs are met exactly when they need to be, our jet charter representatives are available to assist you 24 hours a day and 7 days a week. Chartering a private flight to Florida is pretty much always a good idea, and as the Treasure Coast’s hidden gem, Port St. Lucie makes it even better. Predominantly a vacation-y beach town, Port St. Lucie is chock full of cute beachside cottages, contemporary resorts, and charming bed and breakfasts that are sure to meet the needs of any private jet traveler. If you’re with family or on a solo getaway, consider staying a night at the iconic Sandpiper Bay Club Med and experience the best in luxury and comfort that the city has to offer. Sequestered along the meandering St. Lucie river, this luxury resort boasts several gourmet restaurants, a gorgeous infinity pool, and a plethora of sports and relaxation activities to keep you in vacation mode throughout your trip. But wherever you decide to stay while you’re in the area, the best way to get there is by booking a private flight to the local airport, and Port St. Lucie Jet Charter is ready to help you do just that. And to help you choose the best place to stay during your visit, we’ve compiled a list of the best lodging options in the area for private jet travelers. Based on Port Saint Lucie Jet Charter client feedback, online reviews, amenities offered, and location, there’s sure to be something on the list that’s perfect for you and whoever you bring; keep reading to check it out. Private flyers on the Treasure Coast will find that it’s a pretty quiet region- lots of nature preserves, beachside parks, kayaking, cyclists, and wildlife. This is definitely not a bad thing for most people, as long as there’s someone to point them in the direction of all the fun stuff. Hidden just off the beaten path, you’ll see dense mangroves where you can kayak for hours without encountering another person. If you’re interested in surfing or boogie boarding, certain beaches in Port St. Lucie, Sebastian, and Jupiter boast some of the best waves in the state. Sebastian Inlet State Park is interesting even if you’re not into the board sports, because lots of professionals hang out there anyways (they’re fun to watch). 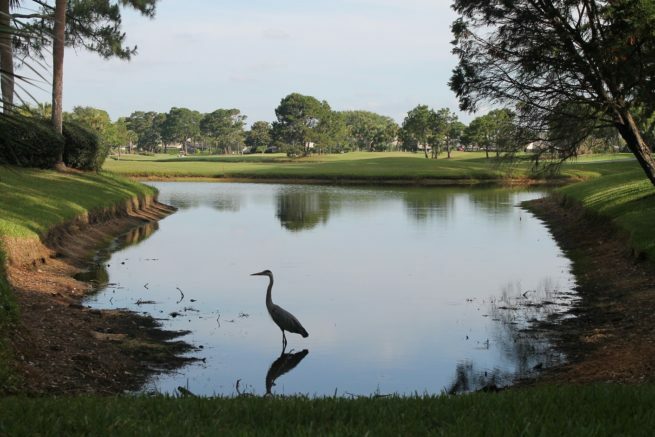 Keeping things outdoors, but toning down the adventure a bit, we have several very nice golf courses in and around Port St. Lucie. Several PGA events take place at the courses, and the PGA Village Golf Club is highly trafficked by current and retired professionals. All in all, golfers will find that the Treasure Coast has no shortage of interesting and challenging holes for players of every skill level. Now, just because the Treasure Coast shines through its outstanding outdoors activities, doesn’t mean that there isn’t anything for night owls to do. Port Saint Lucie definitely has its fair share of bars, restaurants, and music venues. So whether you’re a foodie that needs to try the local fare before you can call it a good trip, or you’re a music aficionado that thrives in elegant jazz clubs and loud rock bars, you’ll be able to get your fix- no problem. If you find yourself looking for a relaxing place to kick back and have a drink, The Vine and Barley is a popular choice amongst locals and travelers alike. This casual lounge serving wine and beer is popular due to its extensive wine and beer selection, its impeccable service, and its lively atmosphere; this makes it perfect for private jet travelers. Now, if you’re craving food over drinks, you’ll definitely want to try out one of the many seafood restaurants in the area. We recommend Fernando’s Dockside Grille for private jet travelers that are craving gourmet food but don’t want to stray too far from the water’s edge. Offering top-notch Mediterranean fare in a sophisticated seaside venue, this local fine-dining tradition begs a second glance from all who pass it by. And, for those that turn around to try it out, it becomes an all-time favorite. Request a Quote or give us a call at 1-888-987-5387 to speak with one of our Port Saint Lucie Private Jet Charter agents for your next luxury vacation, business trip, or special event.